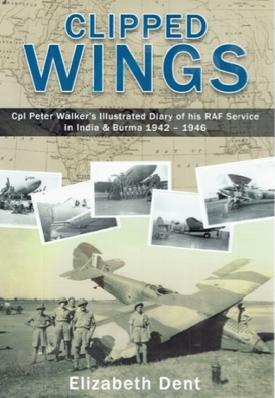 75 years ago, Cpl Peter Walker started an incredibly detailed diary of life as a member of the RAF ground crew during the Second World War, stationed firstly at a Staging Post in India and then with 31 Squadron in Burma. In 2007 Peter’s daughter, Liz Dent, intercepted an old trunk from her mother’s attic headed for the skip. The trunk turned out to be a capsule of a forgotten time: the story of a man who had fought for his country 5,000 miles away from home. Peter Walker was a trained pilot but grounded by the RAF when it was discovered he was colour-blind, and sent to service the planes rather than to fly them. Peter, a well-educated man, was able to document and photograph all aspects of life as part of the ground crew. Inside the trunk were over 500 photographs, letters, documents and detailed diaries spanning over 4 years’ service. Over the past 6 years Liz has taken the story started ¾ of a century ago by her father and transformed it into a 200 page book, complete with many photographs and original diary exerpts. In order to bring this story to life, Liz is looking to the public to help her fund her creative project via the crowdfunding site Kickstarter.